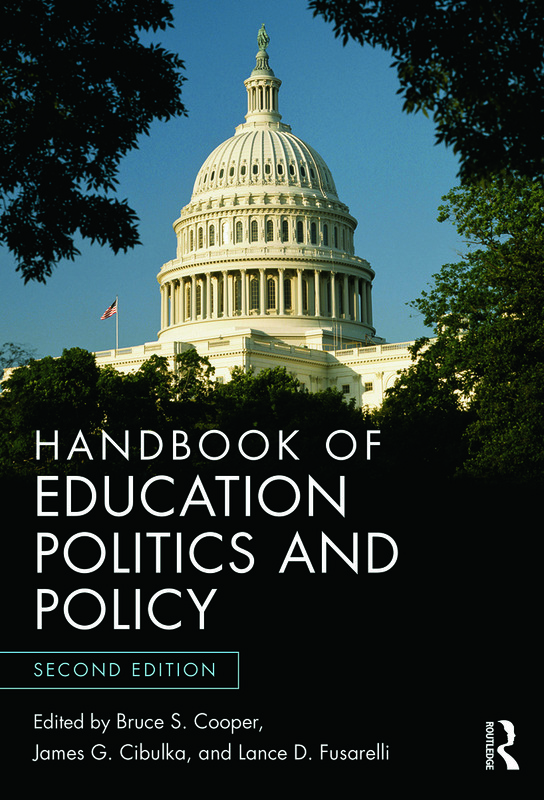 This revised edition of the Handbook of Education Politics and Policy presents the latest research and theory on the most important topics within the field of the politics of education. Well-known scholars in the fields of school leadership, politics, policy, law, finance, and educational reform examine the institutional backdrop to our educational system, the political behaviors and cultural influences operating within schools, and the ideological and philosophical positions that frame discussions of educational equity and reform. In its second edition, this comprehensive handbook has been updated to capture recent developments in the politics of education, including Race to the Top and the Common Core State Standards, and to address the changing role politics play in shaping and influencing school policy and reform. Detailed discussions of key topics touch upon important themes in educational politics, helping leaders understand issues of innovation, teacher evaluation, tensions between state and federal lawmakers over new reforms and testing, and how to increase student achievement. Chapter authors also provide suggestions for improving the political behaviors of key educational groups and individuals with the hope that an understanding of political goals, governance processes, and policy outcomes may contribute to ongoing school reform. "In this revised edition of their Handbook, Cooper, Cibulka, and Fusarelli have brought together a superb collection of material that is of value to both educational scholars and practitioners. Scholars will find a succinct discussion of critical institutional and policy issues. Practitioners will find the book an excellent starting place to understand the politics and institutional pressures facing the schools they lead. The book’s structure offers an excellent starting place for in-depth analyses of complex educational issues and provides readers with quick introductions to the major issues they face on a daily basis." "This comprehensive Handbook is the new go-to source for all readers, whatever their political views. Pooling together writings from leading researchers, the compendium covers new developments in political institutions and interest groups and tackles controversial topics from school choice and religion in schools to equity, school finance, and integrated education." "The revised Handbook will be a great resource for teaching and research. It reflects the latest issues while providing insights into the enduring features of education policy and politics." Preface: Constants and Changes in the Politics of Education. PART I: THE INSTITUTIONAL CONTEXT OF EDUCATIONAL POLITICS. Chapter 1: Beyond Pluralistic Patterns of Power: Research on the Micropolitics of Schools. Chapter 2: Hitting a Moving Target: How Politics Determines the Changing Roles of Superintendents and School Boards. Chapter 3: Advocates and Partners for Education Excellence: A 21st Century Role for Mayors. Chapter 4: Understanding Education Policymaking and Policy Change in the American States: Learning from Contemporary Policy Theory. Chapter 5: Political Cultures in Education: Emerging Perspectives. Chapter 6: Judicial Impact on Education Politics and Policies. Chapter 7: The Politics of School Finance in the New Normal Era. Chapter 8: Federal Education Policy from Reagan to Obama: Convergence, Divergence, and “Control”. Chapter 9: Federalism, Equity, and Accountability in Education. PART II: INTEREST GROUPS, ACTIVISTS, ENTREPRENEURS, AND EDUCATION REFORM. Chapter 10: Binders of Women and the Blinders of Men: Feminism and the Politics of Education. Chapter 11: Religious Faith and Policy in Public Education: A Political and Historical Analysis of the Christian Right in American Schooling. Chapter 12: Respecting Religion and Culture in Schools: An International Overview. Chapter 13: The Politics of Entrepreneurship and Innovation. Chapter 14: The Ideological and Political Landscape of School Choice Advocacy. Chapter 15: The Collective Politics of Teacher Unionism. Chapter 16: Outliers: Political Forces in Gifted and Special Education. Chapter 17: A New Kind of Integrated Education. Chapter 18: Interest Groups Revisited. Bruce S. Cooper is a retired Professor of Educational Leadership in the Fordham University Graduate School of Education, USA. James G. Cibulka is President of the Council for the Accreditation of Educator Preparation(CAEP) and former dean of the College of Education at the University of Kentucky, USA. Lance D. Fusarelli is Professor of Educational Leadership and Educational Policy at North Carolina State University, USA.